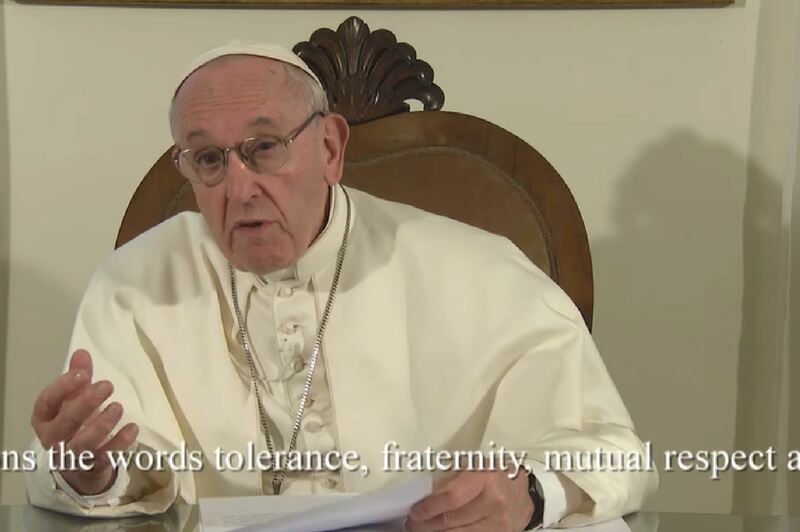 Pope Francis on February 10, 2019, sent a video message to leaders meeting at the World Government Summit, taking place in Dubai from February 10-12. In his video, the Holy Father stressed the importance of solidarity among world leaders for achieving the common good. I send you greetings and best wishes for your work. I carry in my heart the visit I have just made to the United Arab Emirates and the warm welcome I received. I encountered a modern country which is looking to the future without forgetting its roots. I saw a country seeking to transform into concrete initiatives and actions the words tolerance, fraternity, mutual respect, and freedom. I also saw how even in the desert flowers spring up and grow. I returned home with the hope that many deserts in the world can bloom like this. I believe it is possible, but only if we grow together, alongside one another, with openness and respect, willing to take on everyone’s problems, which are the problems of each person in the global village. We cannot really speak of sustainable development without solidarity (cf. Laudato Si’, 159). We could even say that the good if it is not the common good, is not actually good. Perhaps now more than ever, thinking and acting require a true dialogue with others because without others there is no future for me. I hope then, that in your activities you start from the faces of persons, from an awareness of the cry of people and of the poor, from reflecting on children’s questions.